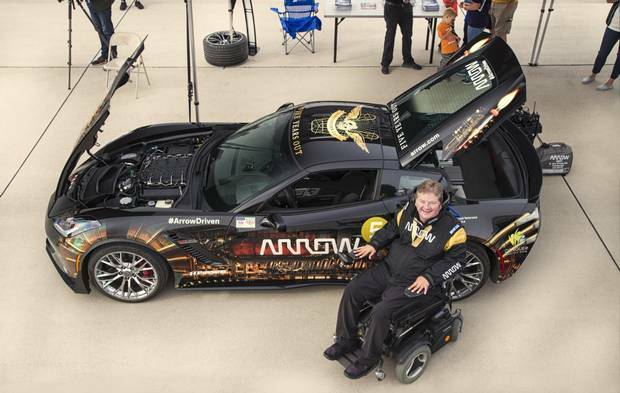 Former Indy car racer Sam Schmidt. 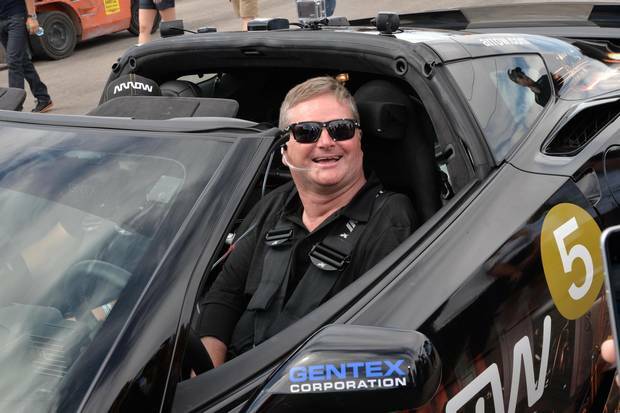 Former Indy car racer Sam Schmidt has a million-dollar car that allows him to do something that people said he would never be able to do again – drive on his own. But he still can't wait for fully autonomous vehicles to arrive. Not for driving on the track, where he feels fully safe manoeuvring his modified 2016 Corvette Stingray by using special gears created for quadriplegics. Rather, Schmidt says he needs the safety features found in autonomous cars to face the intimidating streets of Las Vegas, where he lives. "I don't feel comfortable on the street," says Schmidt, who lost the use of his four limbs in a 2000 crash on a racetrack in Orlando. He's the first quadriplegic in the United States to have an unrestricted licence to drive a semi-autonomous car. Schmidt feels safer manoeuvring his modified 2016 Corvette Stingray on the track than he does driving in the streets. "I want to have the security of backup systems in place," he says. Calgarian Barry Lindemann also can't wait for the freedom he associates with fully autonomous cars being developed by Tesla and many other auto makers. "I ride by the Tesla dealership every day. I can't wait until they start offering these cars," says Lindemann, who became a quadriplegic after a diving accident 23 years ago. "It's something I'm really excited about. It will revolutionize the way people get around." Two groups in particular could gain more personal mobility with the advent of self-driving cars: people with severe disabilities and aging Canadians who lose their licence for health reasons. Larry Hutchinson, president and chief executive officer of Toyota Canada, highlighted those two groups in a recent speech in Toronto. Calling the potential for automated technology to revolutionize transportation and transform society, he said: "Think about the life-changing impact autonomous vehicles will have on the millions of people with mobility challenges. "The elderly. People with disabilities. Or people who can't afford to own their own car." People with disabilities have quite a bit of confidence in the technology, says Robyn Robertson, president and CEO of the Ottawa-based Traffic Injury Research Foundation (TIRF), which polled Canadians on autonomous cars in 2016. Seniors, however, are much more skeptical. "Seniors have probably the potential to reap the greatest benefits from the technology," Robertson says. "But they don't trust it." Instead, the most enthusiastic advocates for autonomous driving are people who drive longer distances and younger males – "the crash population," as Robertson refers to the latter group. Lindemann, a client-relationship associate with TD Wealth in Calgary, says one of the biggest pluses to autonomous cars would be the ability to not have to constantly depend on a driver to get around. "Sometimes, you just want to get away for yourself," he says, noting he frequently won't go to events because a ride can't be arranged. Modern lift equipment is at the point of being able to place a quadriplegic into a car without human assistance, he says. "The power wheelchair just locks you in place," Lindemann says. "Once you lock in, you just close the door and say, 'Take me to the bar.' "
Schmidt notes another important benefit to autonomous cars – the relative affordability, if they are only used on demand. 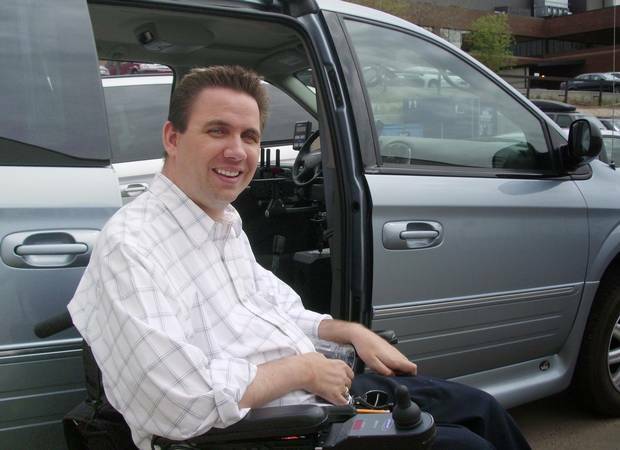 Equipping a van to accommodate a quadriplegic costs around $80,000 (U.S.) (and, Lindemann says, $130,000 in Canada), which puts them out of reach for many disabled persons. Being able to rely on an Uber-like service, in which a person pays for the car only while using it, could put the mobility option within reach. The advocacy group Canadian Association of Retired People has not yet taken a position on autonomous cars, says Tamara Cormak, director of communications. "We often receive personal stories from members on various issues, but not on this one yet." Its U.S. counterpart, however, is fully behind the concept of shared self-driving cars. 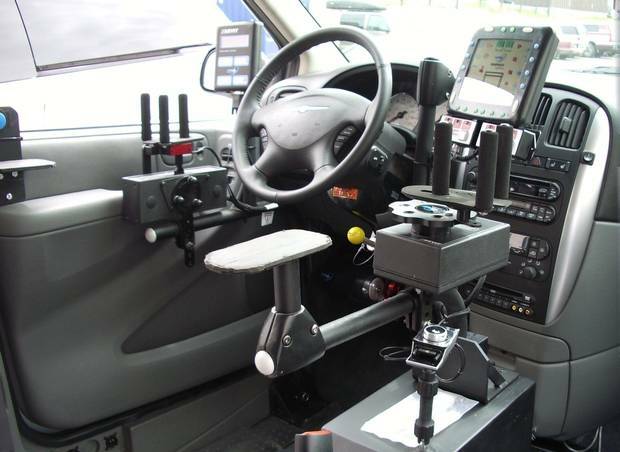 The American Association of Retired Persons (AARP) says in a policy statement that this "disruptive technology" could correct systemic problems in the U.S. transportation system that make it difficult for people to own and operate their own vehicles. "This leads to problems for the one-third of people living in the U.S. who do not drive. Moving forward, shared-use mobility – such as car-sharing, ride-sharing, ride-splitting – may be a tool to influence development patterns and individual travel choices," according to the AARP statement. The trend has drawn investor interest. A Canadian investment fund launched the world's first "future car" exchange-traded fund in September, giving investors one-stop access to companies involved in electric, autonomous and connected car supply chains. "There's a lot of investor appetite out there searching for ways to express their belief in the theme," said Elliot Johnson, chief operating officer of Evolve Funds Group, about its Automobile Innovation Index ETF. Not so fast, TIRF's Robertson says. She says there are still some major obstacles to be addressed before fully autonomous cars are set loose on the road. Driverless technology "has a lot of potential," but it is far from perfect. Autonomous cars allow drivers to disengage from the driving experience, and that can be dangerous, especially if they think the computer is capable of getting them out of dangerous driving situations. "Canadians want to rely on automation in conditions when technology will most likely fail," she says, such as during adverse road conditions or unexpected behaviour from other drivers. Drivers need to be able to re-engage almost instantly in such circumstances, and yet we have been lulled into trusting the computer: "The car says, 'You're up,' and you're not prepared," Robertson says. "As we become reliant on technology, we lose some of the basic skills," she says. Humans are still better at making decisions in an emergency, Robertson says. In an emergency, autonomous cars have to engage in "ethical decision-making" in the face of complex factors, such as who to protect. For example, "Would you protect a vehicle with a car seat in it over a car that has two adults in it?" she asks. Prioritize safety for all road users in regulating autonomous vehicles. Establish standards for thorough testing of autonomous vehicles prior to their deployment and require manufacturers to publish the results of such testing. Bar the use of partially automated vehicles on non-controlled access roads, such as city streets. Ensure consumer security and privacy. Require customer education and training on advanced vehicle technologies. In the near future, Robertson thinks the roads are most likely to feature both types of drivers on the road: people who have full control of their cars and those in semi-autonomous vehicles. To her, it is a worrying scenario. She notes that even as semi-autonomous vehicles have been introduced to U.S. roads, the rate of crashes since 2015 has gone up. Whether fully autonomous cars are ever acceptable depends on whether engineers and technologists can "solve that last 10 per cent" of design that would make them reliable, predictable and able to respond to unexpected situations. As for her? "I've ridden in one on a freeway. I wouldn't be comfortable not paying attention."